Brenda Mae Tarpley (born December 11, 1944), better known as Brenda Lee, is an American performer who sang rockabilly, pop and country music, and had 37 US chart hits during the 1960s, a number surpassed only by Elvis Presley, The Beatles, Ray Charles and Connie Francis. She is best known for her 1960 hit "I'm Sorry", and 1958's "Rockin' Around the Christmas Tree", a US holiday standard for more than 50 years. At 4 ft 9 inches tall, she received the nickname Little Miss Dynamite in 1957 after recording the song "Dynamite"; and was one of the earliest pop stars to have a major contemporary international following. 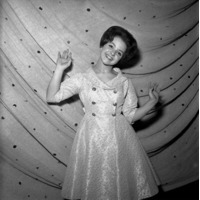 Lee's popularity faded in the late 1960s as her voice matured, but she continued a successful recording career by returning to her roots as a country singer with a string of hits through the 1970s and 1980s. She is a member of the Rock and Roll, Country Music, Rockabilly and Hit Parade Halls of Fame. Lee currently lives in Nashville, Tennessee.